So the kids at school have been asking for quite some time now about planning a Club Penguin Club. I’m thinking to myself this is great!! The kids are taking pride and ownership in their after school program. But on the other hand I had no idea what Club Penguin was. It was time to start doing a little investigating to find out what Club Penguin was all about. I decided the best way to find out what Club Penguin was total immersion so I visited their website at http://www.clubpenguin.com/ and created an account. Club Penguin is a MMOG (massively multiplayer online game) geared towards children aged 6-14. Club Penguin is a fully interactive online community where children can play games and earn coins to buy items for their penguin avatars. At this point I was convinced that this online community was taking the necessary precautions to provide a safe environment. Also, if you decide to lead a Club Penguin Club at your school you can use it as a teaching opportunity to reinforce positive behaviors in youth – how to be safe on the internet, what to do if they do not feel safe, and how to be respectful and friendly to others. So I know I’m an adult and this is normal, but boy was I out of the loop as far as Club Penguin lingo is concerned. 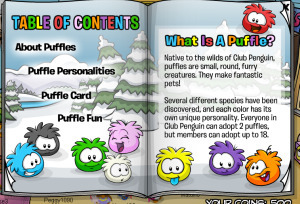 I kept hearing the term “puffle” which I assumed was an endearing term for their penguin avatars. But then I overheard a group talking about puffles and drawing pictures of them. The images of puffles they were drawing did not look like penguins to me. So I asked the children, “In Club Penguin, what is a puffle?” I got an immediate response from almost every child in the group at the same time – they were so excited to tell me about Puffles. Puffles are the companion pets for their Penguin avatars. They can name them, choose their color and personality, feed and water them and play with them. I knew instantly that incorporating Puffles into Club Penguin Club would be essential! The Club Penguin community website has some awesome activity ideas and printables! Here is my recommended 4 week outline of activities you can use for leading Club Penguin Club ~ but feel free to change it up to suit the needs of your group! Week 2-Yarn Bugs – Make your own puffle and name it!!! 2) Smooth out the puffle and glue the egg cup to the underside. 3) Use the white foam/tag board to create the puffle’s eyes and glue them to the front. 4) Now each child has their very own pet puffle to name and play with!